When you are planning a camping trip, it's crucial that you bring the right clothing for the trip. If you pack inappropriately, you may end up very uncomfortable. Pack too much clothing and you'll be lugging unnecessary weight; too little and you'll might not have what you need for the weather. Plan on one outfit per day, and two or three extras for emergencies. Bring extra socks and underwear. Wet socks aren't good for your feet, and there are times when two pair might be needed. Factor in the weather. If you are tent camping and there is a big swing in daily temperatures, you may need a hoodie and sweats morning and evening and be able to get away with shorts and a tee during the day. Nothing is more miserable than being cold and wet. Rain gear will ensure that you are as comfortable as possible if storms come up. Rain gear means more than a poncho. Waterproof pants and footwear are important too. New waterproof materials offer lightweight options that are both warm and water resistant. Be sure to bring comfortable nightwear. Factor in the weight of your sleeping bag before deciding how warmly to dress at night. When you choose what jammies to bring remember that you may be hiking to the bathroom at night. That cute little nightie or the cartoon character boxers may not be the best choice. 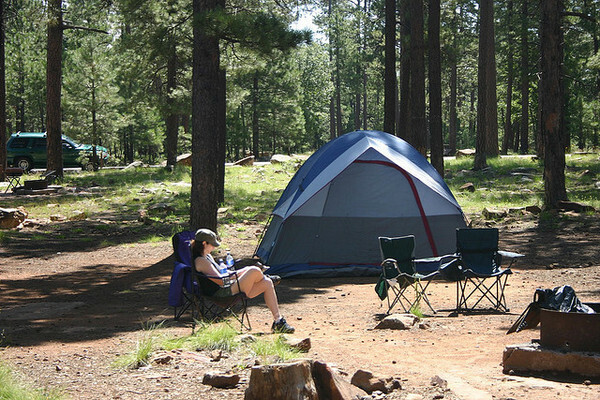 The activity level when you're camping can vary greatly throughout the day. After you have worked up a sweat chopping wood you may be sitting quietly by the fire. It's important that your clothing can breathe as you change temperatures. At one time, natural fibers, like cotton, were the recommended fabric for camping clothing, and wool for socks and outerwear. Some of the amazing new synthetics have changed all that. These new materials are great at wicking away moisture as you sweat and will help prevent you from getting chilled as your activity level drops. They also dry out much faster than cotton does. A good camping store can help you select what you need. Two of the most popular choices are nylon and polyester. Most of the new performance fabrics designed for active wear are made of one of these. There are some that have copyrighted brand names due to special properties designed in. Look for Supplex nylon or CoolMax or Capilene polyester. There are also a number of rayon based performance fabrics, and even one made of wood pulp, called Tencel. Most rayon garments for day wear are dryclean only. Camping clothing made from rayon is fully washable and dryable. (Double check the tags before purchasing to be sure.) Rayon clothing dries quickly and is wrinkle resistant, but is less effective at wicking away moisture than polyester or cotton. A Cotton and polyester blend is another option. Some prefer the feel of a part-cotton piece of clothing. Just bear in mind that it will not dry as quickly as a straight polyester or nylon garment will. For outer wear, Goretex and Polartec are great choices. These fabrics are designed to be lightweight, warm and to handle perspiration effectively. Resist polypropylene in your clothing choices. Polypro is much more flammable than polyester. It's not worth the risk of injury. There are now advanced fabrics that block damaging UV light. The material is impregnated with special dyes and chemicals that deflect UV sunrays. If you're looking into this type of clothing, the labels will give a UPF (Ultraviolet Protection Factor) from 15 to 50. The sun protection is good for the life of the garment. And you can get built-in insect protection in your shirt too. With the increased risks of Lyme disease and West Nile virus, clothing with repellant is a timely idea. The insecticide used is permethrin, which is considered one of the safer repellants in use. The protective properties of the fabric last through 70 washings. When choosing clothes to bring camping, please don't skimp on your footwear. Quality hiking boots made of leather are a good way to go, and make sure that you take extra shoes in case your boots get wet. Wet feet can ruin your day.